Black Widow spider from the USA travels to the UK in a VW Camper van! A Black Widow spider was brought to the Stratford Butterfly Farm recently after being found in a VW Camper van imported from Sacramento in California. The couple that owned the camper van had it shipped over last October and have since stored it in their garage. It was only recently that they took it to a garage in Strensham, Worcestershire where the deadly spider was discovered by a mechanic who was power washing the underneath. The mechanic realised what it was from the spider's distinctive bright red hour glass marking on the underside of its abdomen. After calling the RSPCA, the spider has since been rehomed at the Stratford Butterfly Farm in an alarmed tank in Arachnoland for visitors to view. As the spider is renowned for being incredibly tough and living in dark crevices, it was easy for it to remain unnoticed in the camper van. It would have eaten insects to survive and caught its prey by snaring it in its web. Although living in the van for the last 11 months, it appears completely unscathed after its travels from the USA. The Black Widow, which is female, has now settled into its new home in Stratford, thousands of miles from its original home in California. 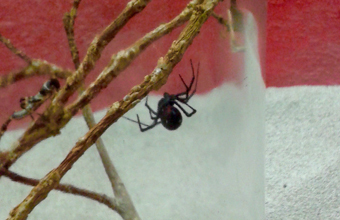 It is the only Black Widow currently residing at the Farm. Black Widows are known to be one of the most poisonous spiders in the world with venom 15 times more potent than a rattlesnake. The venom, although potentially lethal is only administered in minute quantities, so when diluted within a healthy human body it rarely causes death. In the U.S between 1950 and 1989 only 63 deaths were reported, about 2-3% of recorded bites. Black Widows, although very poisonous do not attack readily, in fact they are not aggressive at all and will only bite if they are frightened. Female Black Widow spiders are notorious for cannibalising their mates after copulation to ensure they are well fed to get through pregnancy. They can lay up to 900 eggs in an egg sack. To see the traveling Black Widow spider and hundreds of spectacular butterflies, insects, reptiles and spiders visit the Butterfly Farm from 10:00am to 5.30pm every day of the week. Entry fees are Adults £6.25, Seniors & Students £5.75, Children (under 3's go free) £5.25, Family (2 adults & 2 children) £18.50. Group discounts are available. Registered Carers are admitted free of charge.